I made my own simple skin; but I agree that youtube fan-nerds need to lay off and get their own skins, I've seen enough people saying that they use the kakashi skin that Etho uses, because they want to be like etho, most of them don't even know who the skin is portraying. If you have a redstone question - don't be afraid to ask it. If you are to afraid to ask it on the forums, send me a private message. My skin is just me in a Skyrim-ish Medieval outfit. But I really hate the anime ones, animal ones, mob suits, and superhero skins. My skin is a man in a trench coat wearing sunglasses and a fedora. What you have to keep in mind is that there are a lot of younger kids who play Minecraft. They like their superheroes and cartoon characters (so do their dads - I have a Tick skin - I don't want to take the time to make my own). They also like to imitate the people they see on youtube just like they would imitate stars and athletes in real life. My son is seven and he has a Picachu (sp?) skin because that is what he likes. Of course I don't let him play on public servers so you wouldn't see him, heheh. Um, yeah... sorry about that. How do you even do shading properly, or even noise? Is there some kind of tool for it? I have absolutely no idea how to select the, like, gradiated colors or whatever they're called. And adding stuff like knees, elbows, and fingers is a fine art as far as I'm concerned. 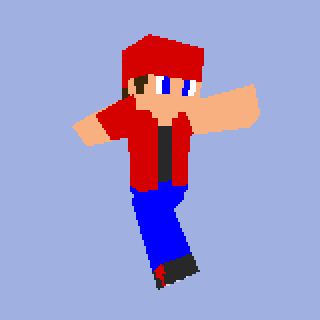 I use MCSkin3D for "gradient" colors. I use the "lighten/darken" tool, and the darker the area, the more clicks I use with the darken tool. Same goes with the lighten tool. Brighter areas equal more clicks.. Most of the skins I make will follow a general pattern. Sometimes I have to adjust depending on what's on the skin however. I should probably explain what I mean by this "single shaded colors" thing. This looks rushed, like it took only 5 seconds to make. It's just a personal thing I dislike (some other people probably do too). If this is all you can do, that's absolutely fine. I'm not criticizing anyone lol. There's slight detail added (minor shade, and fingers added). To me, this looks a bit better than the previous pic. Again, it's only a matter of opinion. It doesn't cause rage, like the damn emo skin that I see on every server in existence, but it's just something I dislike. I don't see why everyone hates animal skins (or perhaps everyone is referring to the minecraft animal mobs, like cows/chickens/sheep). I happen to have made several and I kinda like them lol. I like seeing a variety of skins. Helps me tell people apart even though there's a giant name floating over them, like when there's a crowd and the names become a jumble. Mine's in my avatar (I've altered the color scheme a bit to be a little more muted since then). Kind of just went with a random idea for that one, then iterated over it a few times however long I've been playing. I'm no expert artist, but I threw a bit of detail and shading in. Don't like the terrain? Go build your own. You can totally do that in this game. I agree with all of them but this one, there's nothing wrong with the default! mob in a suit. overdone to death. Ha, I had one for a day, then reverted back to my enderman in a suit. Another game I played had an option where players could submit their own graphics as well to be used in game. Almost everyone would either steal them, or make slight edits to it, and claim 100% ownership. The point is, although it looks ok, it's not something that you yourself made, and really isn't you. I have a constructor man skin, would you consider this overused? I agree with all of these things. One thing I would like to add to the discussion about girl skins with their eyes is that it's not too easy to indicate a girl. The eyes make it simple to do. But those girl skins man. They're scarier than any other skin in existence. 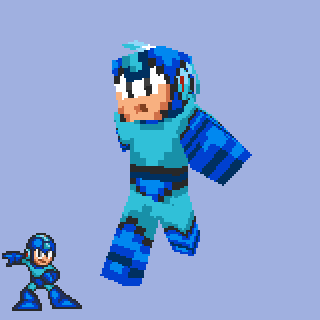 I find a bit too easy to make your own skin. There's no point getting a skin from from site for free. 3. Add something clever to it for uniqueness. So I based my skin off of my clothes that day, and added a fish bowl on my head. "Oh hi Samah- OH MY GOSH WHAT'S WRONG WITH YOUR FACE?!" It may be slightly harder, but does EVERY girl skin have to have those eyes and that hair? Seriously, every single girl skin I see has the exact same thing. Huge eyes, and hair that goes down their shoulder. Every one of them are recolors too. It's very annoying. I think it's possible to make a decent girl skin without having those eyes.